This WAS a blank wall! 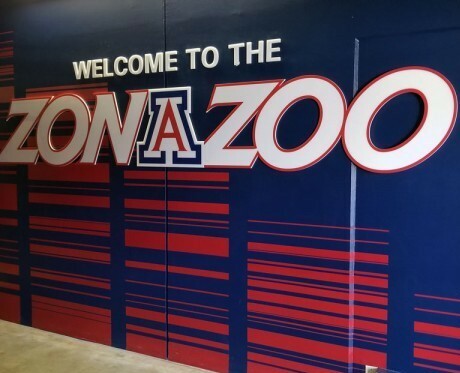 The challenge …branding the student section at the University of Arizona know as ZonaZoo. this started as a flat masonry surface The objective was to have three dimensional letters and logos that would make a statement. The project started with the wall being painted University of Arizona blue. Next, and fabricated (routed) from white acrylic, ZonaZoo was designed and the lettering in-lined with red. The Arizona “Block A” was laser cut and vinyl applied to the logo. LED lights illuminate the dimensional letters in the rear of the sign. We used red vinyl stripes which were applied to the blue, painted, wall to complete the project. An amazing transformation! Using a variety of different technologies, all of which Graphic Impact have in house turned out to be a significant advantage in completing this project.